Two dozen test methods and performance metrics developed by NIST will allow small unmanned aircraft systems (sUAS) and aerial system pilots to get comprehensively evaluated and quantitatively compared prior to deploying into more operationally significant scenarios involving mock villages and cities with scripted scenarios. Embedded standard test apparatuses within the scenarios enable periodic measurement of performance to capture degradations that may occur due to environmental variables such as shadows,smoke, etc. 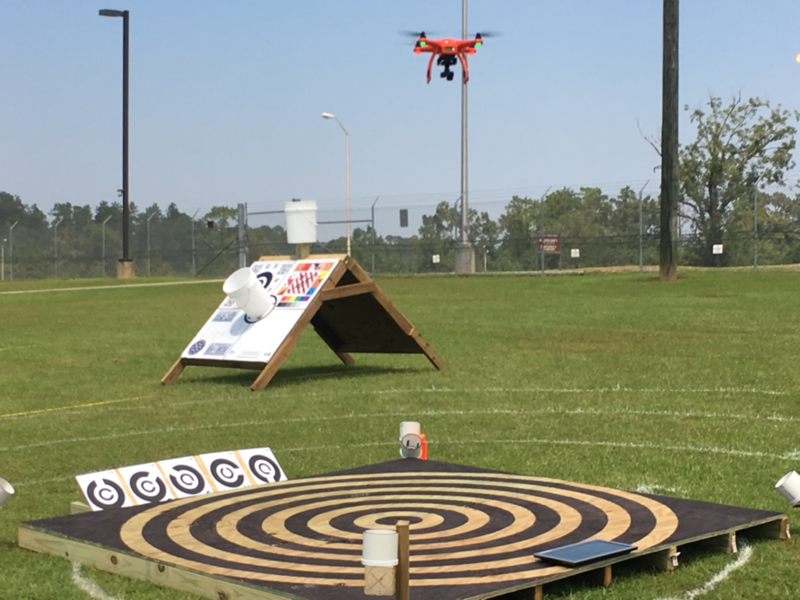 The Department of Homeland Security's first site for evaluating small unmanned aircraft systems (sUAS) is located at Army Camp Shelby in Hattiesburg,MS. NIST's test methods and performance metrics are providing the basis for a new strategic collaboration between the National Fire Protection Association (NFPA)and ASTM International. ASTM will standardize the underlying test methods. NFPA will select various combinations of those test methods representing essential mission capabilities to define sUAS equipment standards for public safety operations.This collaboration across the two standards organizations will help guide purchases and focus training for fire departments. It may also lead to credentialing of aerial system pilots more generally, including emergency responders and hobbyists. Several organizations have already expressed interest in using NIST's test methods to support credentialing, as have various other state and federal organizations. The suite includes 15 draft standard test methods for evaluating small initial emphasis on vertical take-off and landing systems and small hand launched fixed wing systems. For the VTOL systems, testing and practice starts within netted aviaries indoors and outdoors to avoid issues of flying in the national airspace. The test methods measure essential capabilities of robots and operator proficiency for hazardous missions defined by emergency responders and soldiers. A “standard robot” is a completely different concept and should be carefully considered. A standard robot would presumably meet a well-defined equipment specification for size, shape, capabilities, interfaces, and/or other features. Such equipment standards are typically intended to improve compatibility, enable interoperability, increase production, lower costs, etc. This can be important for many reasons, but can also hinder innovation. In this effort, we are not proposing to develop a standard sUAS specification of any kind. Rather, we are proposing to develop standard test methods that can be used to evaluate and compare entire classes of such systems in objective and quantifiable ways. The resulting suite of standard test methods could indeed be used to specify a standard sUAS at some point, similar to how they are used to specify purchases. But that is left to each user community to define for themselves based on their particular mission objectives. We use standard test methods to encourage implementation of new technologies to improve capabilities and measure progress along the way. NIST is leading an international effort to develop the measurements and standards infrastructure necessary to evaluate and compare robotic capabilities for emergency responders and military organizations. 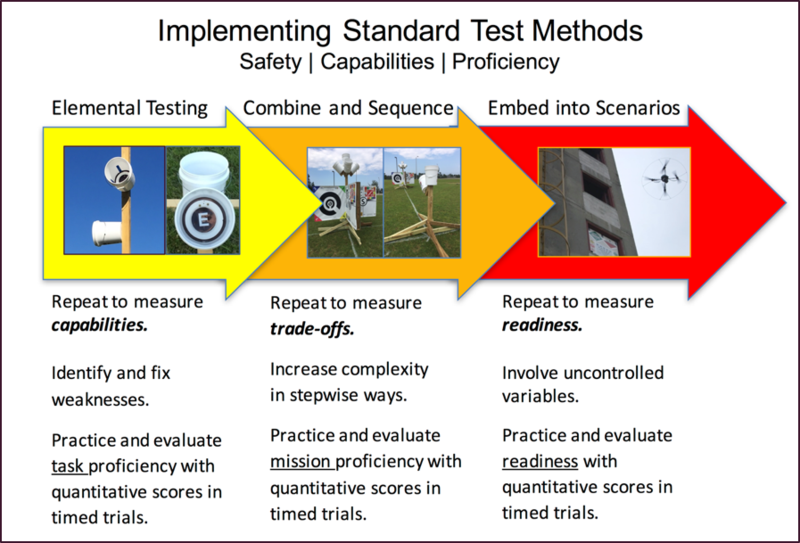 The resulting standard test methods and performance metrics address critical national security challenges by enabling quantitative measurement and comparison of system capabilities and operator proficiency. They have been replicated by dozens of organizations worldwide to measure and evaluate response robot capabilities. They have helped inform procurement and deployment decisions with statistically-significant robot capabilities data for a variety of essential mission tasks. They have also helped guide robot manufacturers toward innovations that answer responder needs while encouraging hardening of developmental systems. To date, these standards have been used to specify more than $70M worth of ground response robot procurements for firefighters, bomb squads, and soldiers. These standards are now beginning to also focus operator training with newly developed measures of operator proficiency. Standard for sUAS Used for Public Safety Operations. Figure 1: A) Test methods for most VTOL systems start indoors to avoid issues with flying in the national airspace. This limits GPS functionality and controls variables such as wind turbulence and lighting. B) The same test methods scale to larger outdoor netted aviaries with higher hover altitudes and measurable but not so repeatable environmental variables. C) The test methods can then be embedded into operational training scenarios to add repeatable tasks into otherwise uncontrolled environments. This helps measure the degradation of performance due to the environmental variables. Figure 2: The test methods and process for evaluating system capabilities and/or operator proficiency is roughly the same. It starts by performing repeated trials using elemental test methods to measure individual capabilities. Then graduates to performing repeatable combinations and sequences of the same test methods to measure trade-offs in capabilities. Then the test methods can be embedded into training scenarios to quantitatively compare baseline capabilities with actual readiness to perform in mostly uncontrolled settings. This project has pioneered the capture and use of quantitative robot capabilities data to inform and specify system purchases. This helps measure technical progress, highlight break-through capabilities, and encourage hardening of systems through repeated testing. This project has developed standard measures of operator proficiency using a circuit training model that enables operators to compare themselves to “expert” performance, or regional and national averages. The test methods help focus training and track very perishable skills over time. This approach has been validated using ground robot test methods with more than 300 bomb technicians internationally in more than 30 locations. This project has hosted dozens of requirements workshops and robot competitions with thousands of participants to refine and validate test methods. These competitions guide developers toward implementing the combinations of capabilities necessary to perform essential mission tasks. Several “best-in-class” ground robots have emerged and been commercialized to deploy advanced mobility, dexterity, and mapping into complex and hazardous environments. Orbit a Point (Move and Rotate) (WK58932) - This test method evaluates the capability to move and rotate around a point. The system performs a series of basic maneuvers using an onboard camera to align with centrally located bucket targets from a defined radius and altitude. Surrounding bucket targets are used to define the intended radius and altitude. This test method can be conducted manually using discrete move and rotate maneuvers or automatically using orbit features of the system. Avoid Obstacles (Figure-8s) (WK58933) - This test method evaluates the capability to maneuver around vertical obstacles (shown as yellow posts) and horizontal obstacles (shown as red bars). The system performs a series of figure-8 paths in various orientations including nose-forward, nose-left, and nose-right. Fly Straight and Level (WK58934) - This test method evaluates the capability to fly straight and level using a visual target as a guide. The system performs a series flights toward such targets either from multiple directions or in a back and forth manner between two targets using the recessed bucket target to assess deviations from the linear trajectory. Land Accurately (WK58935) - This test method evaluates the capability to land accurately from vertical and downward 45 degree descending approaches. The system performs a series landings on a metered platform from a defined range, altitude, and four different approach directions. When performing the angled approaches, the recessed targets are used to guide the descent. Point and Zoom Cameras (WK ####) - This test method evaluates the capability to point and zoom cameras at near- field and far-field visual acuity targets from a specified hover position. The system performs a series of target identifications alternating between near- field and far-field visual acuity targets separated by a 180-degree rotations. Inspect Objects (WK58936)- This test method evaluates the capability to move and rotate around an object of interest to identify key features. The system performs a series of basic maneuvers using an onboard camera to align with centrally located bucket targets from a defined radius and altitude. Surrounding bucket targets are used to define the intended radius and altitude. This test method can be conducted manually using discrete move and rotate maneuvers or automatically using orbit features of the system. Inspect Objects (WK58937) - This test method evaluates the capability to move around an object of interest to inspect key details from close proximity. The system performs a series of basic maneuvers using an onboard camera to align with bucket targets to inspect Downward, Forward, Omni-directional, and Upward (note shown) objects. Map Wide Areas (WK58938) - This test method evaluates the capability to localize and map a variety of known and unknown objects across a wide area. The system performs its mapping function from a prescribed altitude intended to force extensive stitching of images. Ground targets are placed at known locations throughout a scenario. The embedded ground objects are made of standard test apparatuses used in other test methods and operationally significant items. Map Wide Areas (WKXXXX) - This test method evaluates the capability to drop a payload accurately from a defined altitude. The system performs a series of drops on a metered platform from different altitudes. The payloads can be weighted surrogates or operationally significant delivery items.